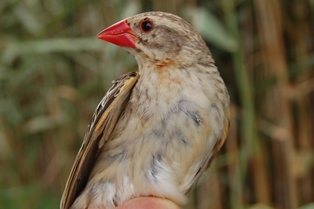 The Red-billed Quelea has increased in the Western Cape in recent decades, and ringing is helping to monitor this species. 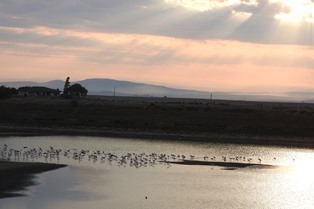 A team (John Fincham, Barry and Sue Schultz, and Dieter Oschadleus) visited Vyevlei diary farm for the third year to catch quelea and other birds. 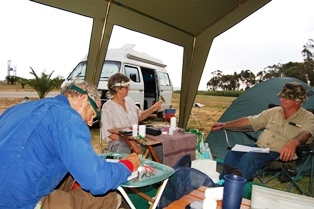 We arrived late on Friday to prepare camp and set up nets, and ringed most of Saturday and also on Sunday morning. We caught mostly Southern Red Bishops. On Saturday morning we caught a flock of about 50 Common Waxbills, and then a few more the next morning. The Cape Weavers and Common Waxbills had mostly completed moult, the Southern Masked Weavers and Southern Red Bishops were halfway to complete in wing moult, and the Red-billed Quelea had not started moult yet. Over half of the quelea were males in full breeding plumage. We caught about 100 birds more on each trip compared to the previous trip, but the number of quelea caught has fluctuated between 50 to 87, indicating that they are present in about the same numbers over the last 3 years. There were 7 recaptures from previous years: 1 Southern Masked Weaver from 2015, 1 Southern Red Bishop from 2014, and 4 Common Waxbills from 2015. In addition, there was 1 Southern Red Bishop that had been ringed at Rocher Pan in Nov 2014 (ring FB59320 ! Thanks! Thanks to Jurie de Kock for letting us camp and ring on Vyevlei! Quelea near Malmesbury, 18-19 Jan 2014 - 204 birds; 87 quelea. 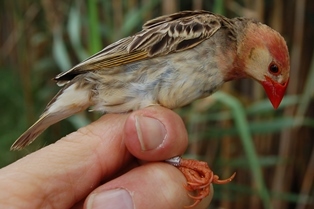 Quelea ringing at Vyevlei, 20-22 Feb 2015 - 317 birds; 50 quelea.